All of this blogging is exhausting and is cutting into my required 18 hours of nap time. So that I can catch up, I will be sleeping in on Monday, January 17, Martin Luther King Day. Consequently, the Library will not open until noon and will close at 8pm. Regular hours will resume on Tuesday. Puzzles away! 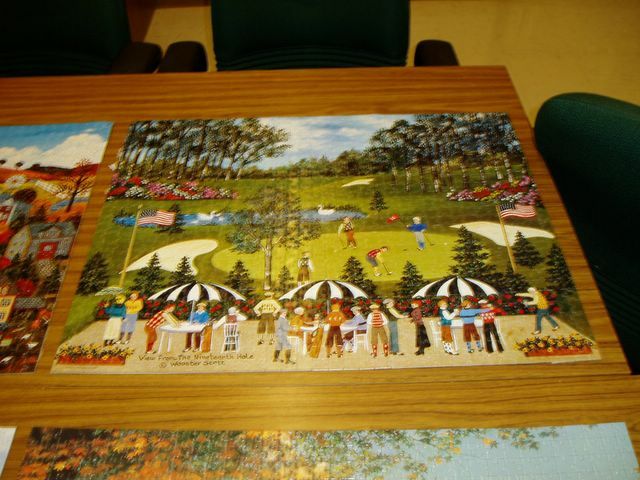 The puzzles (glued but not framed) that were assembled during the Fall 2004 examination period will be raffled off on January 28, 2005. If interested, please drop your name in the designated drop box at Circulation for the drawing. A picture of one of the puzzles is shown here. I am Ernster , the Virtual Library Cat. When I am not engaged in my statutorily required 18 hours (minimum) of napping (see 51 USCA t 13), I am ensuring the smooth operation of the Deane Law Library. I will make sure you get the Cat's-Eye-View of what is happening in the Library. I also have the answer (42), to the question of Life, the Universe and Everything. So, feel free to ask. Looking forward to purring with you. Welcome back! In returning to the library, you may have noticed that our furniture has been rearranged. This reconfiguration was in response to consistent complaints about noise and, conversely, the loss of "talking" space in the library. On the ground floor of the library, the carrels from the main reading room(next to the reference and circulation desks) have been swapped with the tables in the periodicals room and classified stacks. Since tables usually encourage discussion, the main study room will become a new "talking" area. All other areas on the ground floor will be designated quiet areas, and the placement of the carrels should discourage extended discussions. We have requested that additional power outlets be installed under the tables in the main reading room. Happy studying!